The Hagfish also known as Eptatretus stoutii is a fish species that is known for its slimy texture and terrifying appearance. Even though it is a type of fish, The Hagfish is unique because it has its own Class and has it's species inhabit most of the Phylum its in. Most people think because of its body type that it is a poisonous creature, but it actually isn't because they are not related to stingrays or eels. The Hagfish is most related to the Lamprey because of both species having no jaw which means they are Agnatha. Most Hagfish are found in the Pacific Ocean where they inhabit their families and grow their population to make them compete with lampreys to be the most populated species as Agnatha. Most Hagfish can actually kill predators like Sharks with their slime to make them stop attacking as a sign of whats to come. The Hagfish body design is very simple yet extraordinary, It's body is like an eels but instead of having a oval shaped head it's head stops towards its neck. It's head is like a buzz-saw that it can use to attach anything to and has two eyes on top of the buzz-saw shaped head. It is one of the only fish that have this unique body design The way the Hagfish looks is defined by many as the ugliest fish in the sea and has never been consistently looked at by other creatures underwater due to its intimidating look. The Hagfish is very unique in all other areas of its life span but the only boring and less sophisticated topic of the Hagfish has to be it's life cycle. The hagfish's life cycle happens when the female and male Hagfish mate and create eggs during the summer when it is warm and the right temperature. After the eggs hatch, The baby Hagfish looks exactly like the adult Hagfish but smaller and only takes 3 months to grow into an Adult. The Hagfish only has 3 Stages of life cycle and that is egg, young adult, and adult. When the Hagfish is an adult, it has to provide for the eggs by scraping food from the bottom of the sea and using it's head to feed the eggs with the food the adult has provided. 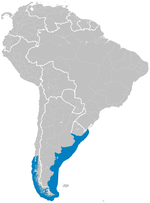 Map of Southern Hagfish inhabiting Brazilian waters. ↑ Forey P. & Janvier P. Agnathans and the origin of jawed vertebrates. Nature 361, 129–134 (1993). ↑ Clark, Andrew California Department of Fish and Wildlife "California Department of Fish and Wildlife" Last accessed 16 October 2007. ↑ "Pacific Hagfishes, Eptatretus stoutii " MarineBio.org." MarineBio Conservation Society [Last update: 1/14/2013 2:22:00 PM] Author Unknown. ↑ Meeuwenberg, Levi "Department of Zoology, University of British Columbia, 6270 University Boulevard, Vancouver, BC V6T 1Z4, Canada." Published 2005, Dec 15). This page was last modified on 11 February 2017, at 13:59.